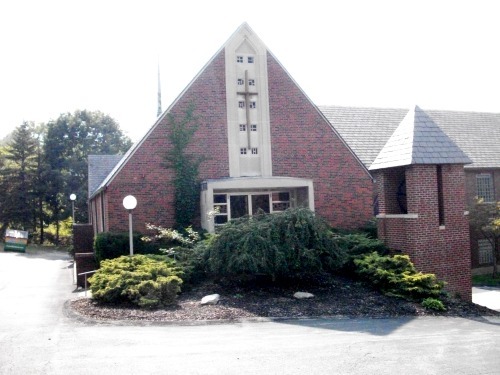 Last Thursday, I was surprised when I encountered the Pittsburgh Post-Gazette headline “Penn Hills church in Anglican Diocese abandons its building.” The headline sounded like it was describing another “Anglican” congregation giving up its building to the Episcopal Diocese. That was indeed what the story was about, but I couldn’t identify what church was involved. The only church I knew of in Penn Hills that either is or was in the Pittsburgh diocese was St. James, and the story was clearly not about St. James. The next day, September 2, 2011, the Pittsburgh Tribune-Review had its own story about the church. In this case, the title was “Verona’s Anglican Church to abandon its facility.” I didn’t recall an Episcopal church in Verona, either. I will return to the matter of the physical location of the church in a moment. Let me first note that All Saints issued a press release on September 1. 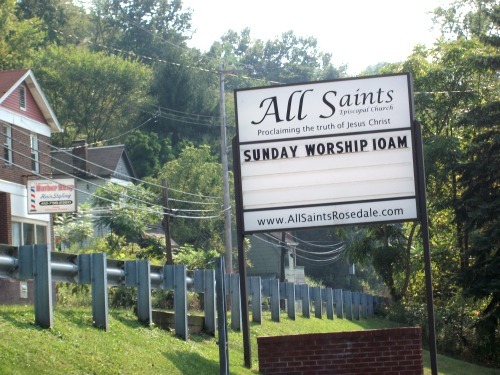 The Anglican Diocese of Pittsburgh, on whose site the press release is hosted, also published a story about the All Saints decision to relinquish the property (wherever it is). That story contains a link to the letter written by David Rucker, rector of the church, to Andy Roman, chancellor of the Episcopal diocese. The Episcopal diocese has had little to say about the matter, curiously, not even mentioning it on its Web site, although diocesan spokesman Rich Creehan was quoted in the newspaper stories saying very little indeed. I do expect that the diocese will issue its own story eventually, but the committee handling property negotiations is quite serious about the negotiations themselves being confidential. Some very good friends are on the committee, but I don’t know more about what’s going on than anyone else. Some extraordinary statements have been made by the “Anglicans,” and I will have more to say about that in another post. Never having seen All Saints, Rosedale, I decided to take a trip to find it yesterday. Like so many of the churches that are or were in the Pittsburgh diocese, it is a bit off the beaten track. Google maps, however, took me right to it, although I was not sure I had taken the right turn until I saw the church before me. Also, like many Pittsburgh churches, All Saints is housed in a quite respectable building. The picture below does not quite do it justice. The sun was behind the church, which was exactly the wrong place for it to be from a photographer’s standpoint. Not shown fully is the substantial building to the right. The building has a large parking lot surrounding it. The paving is not in good shape at the rear but seems fine elsewhere. The landscaping is best not commented upon. The tall steeple on the building is best seen from the rear. I neglected to look for a cornerstone, so I don’t know exactly when the church was built. 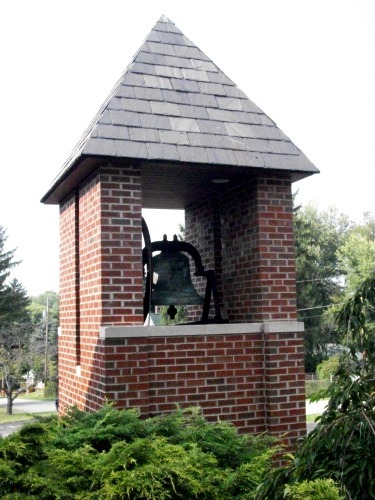 I assume the bell tower, which is an interesting architectural feature, is a later addition. 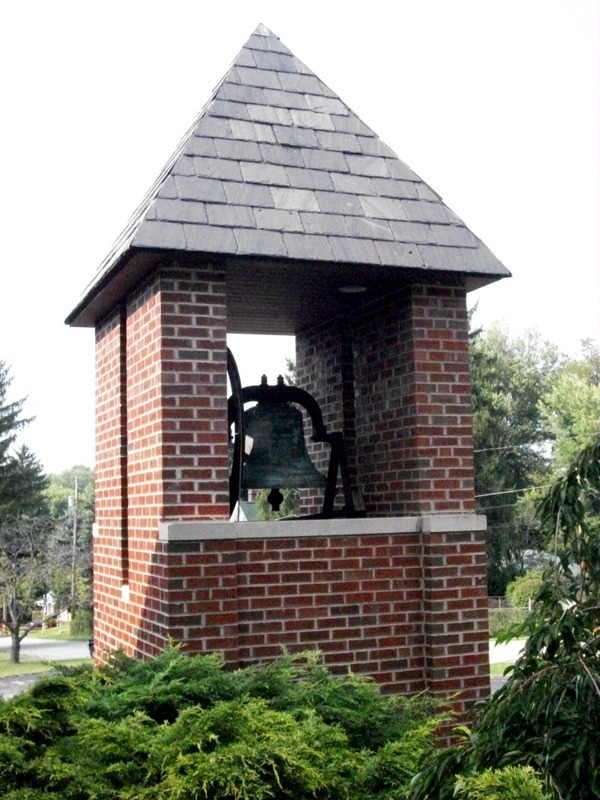 It would be interesting to know the history of the bell, which is dated 1894. The tower was dedicated in 2001. It is sad, of course, when a congregation has to leave memorials such as this one. Nice photos, Lionel. 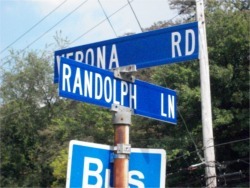 Just to note that in the haziness of our local geography "the Penn Hills area" includes generally a City of Pittsburgh neighborhood (East Hills), a neighborhood of Wilkinsburg (Blackridge), the western and southern sections of Verona (including the Rosedale neighborhood), and Penn Hills proper, which is an incorporated borough. 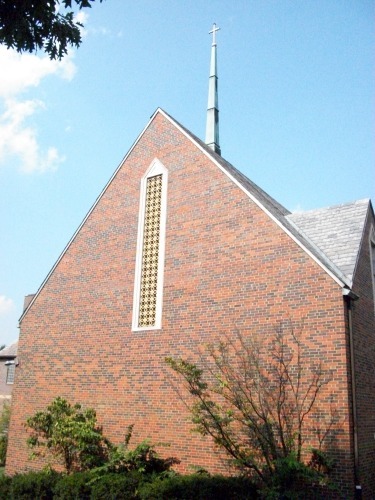 My impression of the congregation is that it has included both long-time neighborhood members and also a few who had over the years "migrated" from St. Stephen's Wilkinsburg. 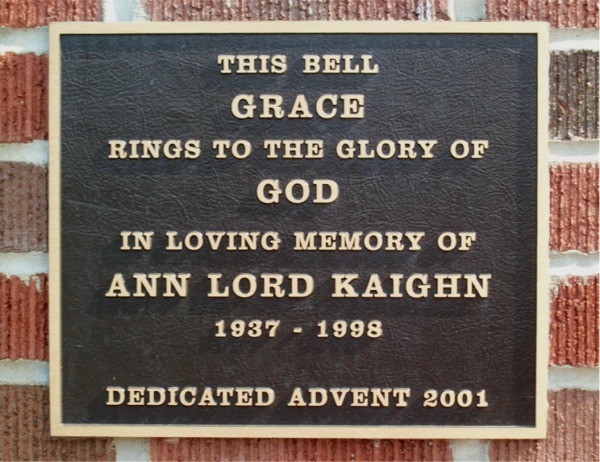 The memorial to Ann Kaighn is indeed touching. She was a lovely, gentle, and gracious person. Her husband Reuel served a long career of ministry here in Pittsburgh. He was thoughtful and generous in many ways, and contributed a lot of time and energy to the revitalization of the clergy association at one point back in the mid '90's. I enjoyed working with him on a number of projects. Actually, I think Ann's death ultimately led to an early retirement for Reuel, with some unhappiness that I don't think the diocese handled very well at the time (though I'm not sure that it could have been handled well!) and then a season of some real unsettledness at All Saints--a small congregation obviously without a lot of internal resources to deal with those kinds of distresses. Perhaps predictably a systemic reaction to the turbulance from the time of Ann's illness and death. In any event, my impression is that Dave Rucker has done a very fine job over a number of years now to restore pastoral stability--and his good relationships with the local, very tight-knit neighborhood I'm sure accounts for the generosity of the Methodists in finding space for the All Saints congregation. When he went out there to serve as lay leader even before he was ordained I had some real doubts about the wisdom of placing an inexperienced person as pastor of a congregation with such a recent history of trouble, but those doubts were dispelled over time when I saw what a good job he was doing. In terms of location, as you know from your excursion, the Rosedale neighborhood is about a 5 minute drive from St. James in the Penn Hills and maybe a couple of minutes more to St. Thomas Oakmont. We have a couple of families from there as well who come to St. Andrew's, which is maybe 12-15 minutes or so away, depending on how you hit the lights at Coal Hollow, Nadine, and Washington Blvd. Thanks for the history lesson. It’s true that All Saints is not far from St. James or St. Thomas, but, given Pittsburgh insularity, I suspect that the churches are very distant psychologically. In any case, it will surely be a challenge to the Pittsburgh diocese to decide what to do with All Saints once we have possession of it. 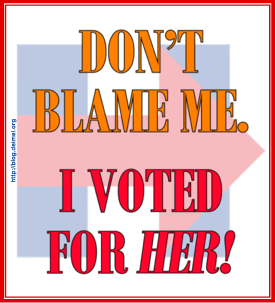 Yes, you've got that right. I know that at least since Reuel's time there the diocese had explored the possibility of "merging" the St. James and All Saints parishes by maintaining two "worship sites" but combining governance and pastoral care. I believe the St. James folks were always game for this--and perhaps that's to be expected, since they would be the larger and stronger part of the combination--but the All Saints folks resisted. I suspect the high water mark for ministry at All Saints was during the long and very effective tenure of Fr. Charles Martin. Dave Wilson posted a slideshow the All Saints folks created to capture a bit of their life together. It includes some nice photos of the church interior. 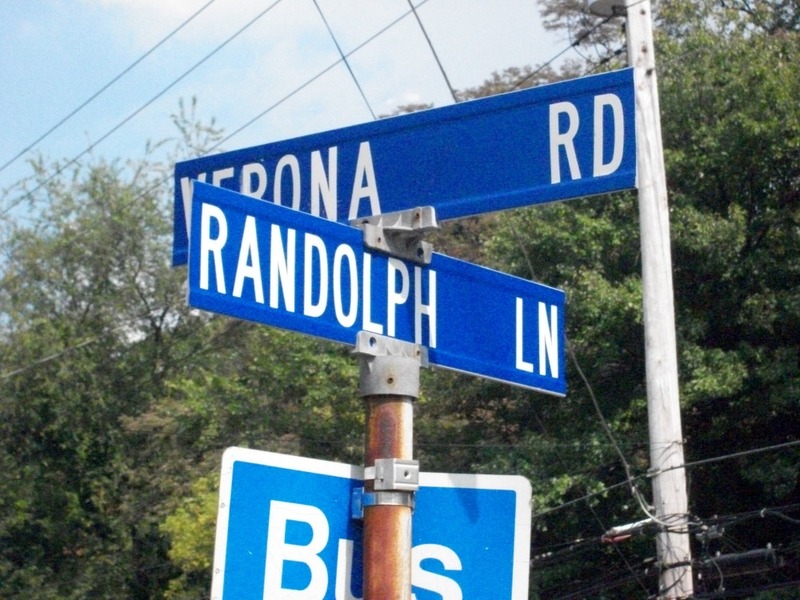 Just to clarify...Rosedale has a mailing address of Verona, but is actually part of Penn Hills Township. Mailing addresses generally do not follow municipal boundaries. With 130 municipalities in Allegheny County and about 90 officially recognized neighborhoods in the City of Pittsburgh alone, it can be pretty difficult to keep track of which things are municipalities rather than neighborhoods and which neighborhoods belong to which municipalities. It doesn't help that some "neighborhoods" are in multiple municipalities--the extreme example being "Regent Square," which includes parts of Pittsburgh, Wilkinsburg, Edgewood and Swissvale (the Regent Square Theatre is a block outside the City and almost at the exact conjunction of the other three). I think you’ve got it right, though various sites on the web led me astray. A map of Penn Hill can be found here. Thanks to all of you for this conversation.